I wanted to touch upon the the subject of price targets and cutting losses as volatility can be scary for some who don’t have a clear cut trading strategy. Before I enter a trade I have specific target area as to where I think the stock may go. These expectations are determined by my “edge.” If you’ve read Trading in the Zone by Mark Douglas than you know an edge is a non-subjective trading signal that puts the odds in your favor of having a profitable trade. 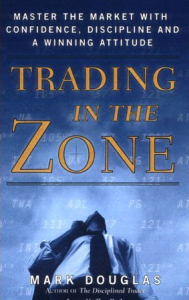 If you haven’t read this book then I feel you’re at a serious disadvantage to your competition –> other traders. This edge must be the same signal every time, without altering how you enter a trade in any way, shape or form. This also means that whatever pool of stocks you fish from to find stocks that fit your edge can’t be too large or you won’t be able to take every trade. My edge has to do with with a very specific chart pattern via hand chosen time frames with the use of only a couple technical indicators. Other people don’t trust or feel comfortable reading charts so they trade stock-specific news, earnings, fundamentals, macro-economic news, or a combination of all of the above. Anything can work, but one must discover an edge that fits their trading personality and test it on a sample size to determine if it’s profitable. For my trading system I tend to use more a price range instead of a hard stop as to where I want to take profits and/or cut my losses should the stock go against me. Call me paranoid, but I don’t like having my order out there for market makers to see and potentially drive the price down to trigger it, only to see the price rise and do exactly what it should have done. Why I’ve chosen a range instead of a hard number target is I’ve found if I set a exact price target and only execute the trade when it hits that specific price, it may come close, but never quite hit it. In that scenario it may reverse and never give me that perfect opportunity to take profits. One key concept is do not fall in love with a stock. There will always be another trading opportunity. If you missed an opportunity to sell for a profit and watched those gains disappear a few times it can really cause you to question yourself and be very frustrating. Take your profits, be thankful and put them to work in a different stock. This may be your only opportunity to exit at these levels and if you’re holding out for more you may find yourself selling at a lower price. JP Morgan joked that ,”he made all my money selling to soon”, so you’ll be keeping good company if you find you leave money on the table after a trade. I know I always sell too soon.